Veneflow Elite of available to sell in Canada to physician offices only. Intermittent pneumatic compression is clinically proven to reduce the risks associated with deep vein thrombosis and pulmonary embolism following surgery. Lachiewicz PF et al, “Two Mechanical Devices for Prophylaxis of Thromboembolism After Total Knee Arthroplasty; A Prospective, Randomised Study.” VenaFlow, utilizing rapid impulse inflation and asymmetric compression, had approximately 50% reduction in the incidence of thromboembolism compared with the Covidien device utilizing circumferential compression. Labropoulos et al, “Improved Venous Return By Elliptical, Sequential and Seamless Air-Cell Compression.” VenaFlow’s design incorporating elliptical, sequential, and rapid-filling compression of the leg with overlapping aircells produces significant hemodynamic changes. The peak velocity average of 328% over baseline maximizes potential for creating shear stress on the endothelial wall and subsequent release of fibrinolytics. 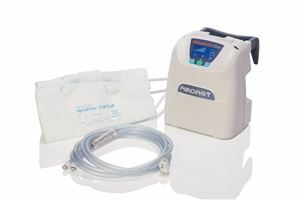 Whitelaw GP et al, “Evaluation of Intermittent Pneumatic Compression Devices.” VenaFlow is the only device to replicate the physiologic contraction of the calf muscles, as shown with venous velocity measurements. Eisele R. et al, “Rapid-Inflation Intermittent Pneumatic Compression for Prevention of Deep Venous Thrombosis.”VenaFlow provides protection to patients at high-risk for DVT. This large, prospective randomized study demonstrates that adding VenaFlow to a chemoprophylaxis regimen significantly lowers DVT. Westrich GH et al, “Thromboembolis Disease Prophylaxis in Patients With Hip Fracture. A Multimodal Approach.” VenaFlow demonstrates one of the lowest rates of DVT (3.5% overall) in this high-risk patient group. A multimodal approach using VenaFlow and chemoprophylaxis is ideal particularly for a high-risk patient population. Liu K et al, “Influences of Inflation Rate and Duration on Vasodilatory Effect by Intermittent Pneumatic Compression in Distant Skeletal Muscle.” Intermittent pneumatic compression devices with an inflation rate of less than one second cause a much greater increase in vessel diameter compared with slower inflation rates. The best inflation parameters for performance are the same as those found in VenaFlow (inflation to 55mmhg in less than a second). Dai G, “The Effects of External Compression on Venous Blood Flow and Tissue Deformation in the Lower Leg.” Asymmetric compression, as used in VenaFlow, produces greater vessel collapse and generates larger blood flow velocities and shear strusses than circumferentially symmetric compression.